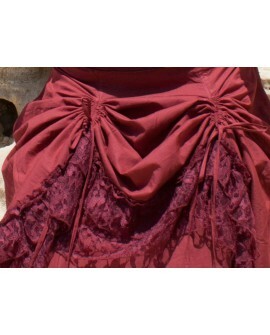 Stunning gypsy skirt, made of cotton and lace. This skirt is very warm as it has a double layer of cotton and a beautiful double layer of gorgeous lace hem line. It is also very versatile as it has an elasticated waist at the back and stings making it easy to adjust the size of the skirt to fit any shape. There are also four pipes going around the skirt on the top layer, which allows for a dramatic style change - please make sure to see all images to have an idea of what can be achieved. This is a staple requirement in any pixies clothing collection. Lower waist (high hip): One size. Lower waist elasticated and additionally tided at the back with crossing string. This skirt will fit you if your size is in between UK 8-16 | AU 8-16 | US 4-12 | EU 36-44.